The ultimate weapon for spin-oriented offensive players! V > 15 Limber is an elastic high-end offensive rubber with excellent spin features and catapult effect. Feel the power and elasticity of the soft 40° offensive sponge and experience the enormous spin potential of the innovative top rubber sheet! Modern offensive players who rely on spinny, variant-rich topspin play will enjoy a whole new dimension of opportunities with V >15 Limber! 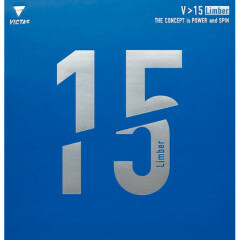 Victas Rubber V > 15 Limber is beeing added to cart.